There were a lot of exciting announcements during the WWDC 2014 Keynote. Some were breathtaking and some were just evolutionary cool. Here's my list of the things that lit me up the most from the most exciting (#1) to the less exciting (#9). Even so, those further down the list show great promise. 1. Swift Programming Language. Designing a new computer language is a significant endeavor. However, considering that there are 800 million iOS devices in the field and that 35 billion iOS apps have been downloaded, Apple is entitled to make this leap. 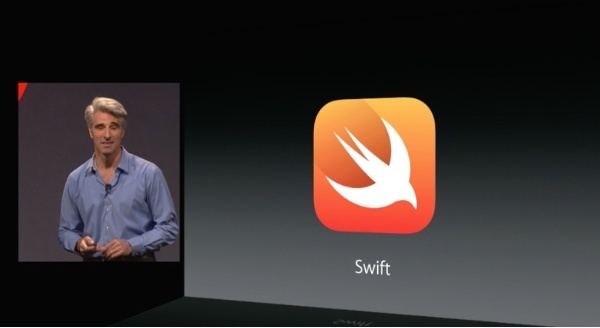 Apple SVP Craig Federighi introduces Swift, Apple's new programming language. One of the primary focuses is to build a language that's designed to be secure from the ground up. In essence Apple is getting in the face of every other mobile competitor and leveraging off its already existing strengths in security. When combined with the "Metal," graphics interface, what appears to be an OpenGL|ES replacement, this is BIG. The repercussions will last for years. 2. iOS 8 Sandbox extensions. This is going to light up the known iOS universe and make the most irritating part of IOS go away. Under the supervision of iOS security, Apps will be able to share data and features, and that's going to ignite content creation. It was probably the one thing that was holding back IOS from its destination with greatness. 3. Air Drop from Mac to iOS device (or the other way around). What took so long? 4. Phone calls from a Mac. This may not be the biggest announcement for many, but it knocked my socks off. It just so darn cool and technical and delightful. And it just makes so darm much sense. You can make the call right from the OS X Contacts, so long as the iPhone is near by. It's so obvious, so delectable. So convenient. 5. iCloud Drive. Visible folders for the storage and sharing of information from OS X to iOS. What took so long? It's going to make using Macs and iPads a whole lot easier. 6. Yosemite Look and Feel. The partial flatening of OS X 10.10 looks great. From what I saw in the keynote, OS X is going to move from a glaring, bold, primary color UI to one of (possibly) pastels, translucency, flattening, more uniform typography. It's the design taste of Jony ive coming through, as it did in iOS 7, and I think I'm going to love it. 7. Mail. Large attachments sent directly to another Mac or links sent to a non Mac is a obvious idea. It doesn't solve the fundamental problems with the Apple Mail app, but it's a huge step in the right direction and in keeping with Apple's penchant for solving irritating problems. The same goes for the mark up of email attachments. 8. HomeKit was covered in a separate article. How big it goes depends on how completely the hardware partners embrace iOS and understand how iOS integration will propel their sales. With luck, this initiative from Apple will take home automation into the mainstream of our Apple life. 9. HealthKit. This was discussed very quickly. We don't yet have a clear picture of how this health data will be stored, secured, and transmitted. Nor how widely it will be embraced. Previously, we thought of the iWatch as a personal way of monitoring, but it's clear some of it has to be in concert with a physician. Because the details were vague and because no hardware was announced, it didn't light me up. But, eventually, HealthKit will be huge. There were lots of other announcements, and you can see them in the Apple video, but these are the items that I got especially exited about right after the keynote.